Hi again!! Your additions to my list about the best things about spring were so great! The next one on my own list was sundresses, but listing five seemed better than six. But flip flops and BBQs and flowers..all so wonderful. 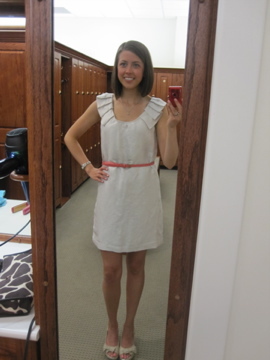 This is a new dress that I got at the J.Crew outlet while in Hilton Head last month. 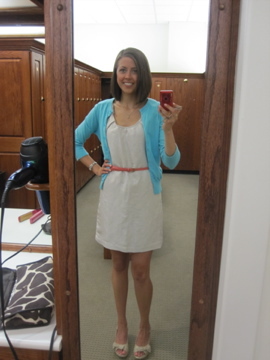 It’s a little bit bag-ish without the belt, but belt-and-go dresses are my favorite! And of course I wore a sweater with it so I wouldn’t freeze my toosh off. It pains me to cover up those cute sleeves though. I used up the last of my pumpkin in some overnight oats topped with 1/2 banana and pecan butter this morning. Good thing too since breakfast at my work meetings today was bacon and waffles as opposed to yesterday’s oatmeal. Oops! It was their Thai Chicken Salad, no chicken and no wonton strips. Whole grain baguette on the side. I finished that by the way. And back at the office I had an apple and then some snap peas and hummus as a snack. I’d been planning a kind of random dinner all day. I wanted a Green Monster in a bowl and a baked sweet potato for some carbs. Not exactly typical dinner fare, but it works! 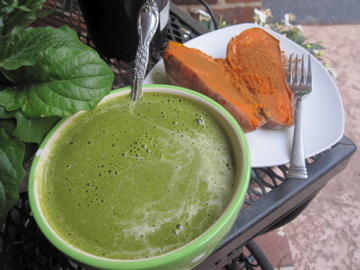 I made my chocolate vanilla Green Monster and topped my baked sweet potato with lots of cinnamon. A handful of unpictured multigrain Wheat Thins finished off the meal. Have you guys seen the new ads that Kashi is running? I found this one in Whole Living Magazine. On the right it lists a whole bunch of common ingredients in packaged foods, explains what they are, and classifies them as “good” or “bad” (Or in their world, things they’d use and things they wouldn’t). I definitely learned something from it! Sometimes there are weird sounding ingredients that are actually just a derivative of a natural food and aren’t all that bad for you. But usually I think any time I see a weird word it’s automatically bad. I think this ad is pretty cool! Not your average food advertisement, but I’m all for educating people and getting them to pay more attention to ingredient lists. What do you think about this ad? Do you think people will actually pay attention to it? I craved a smoothie for dinner too! It was just that kind of night. 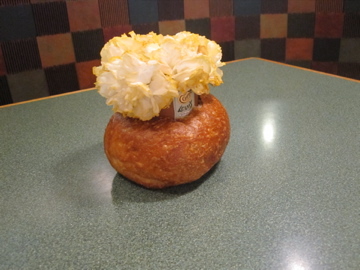 Those bread vases are the cutest thing! I’m tempted to stick one in the middle of my mom’s kitchen table. My cat might eat it though. Kashi is one of my favorite companies, for that very reason! They care so much about REAL food! You are so gorgeous, please spread the tan around?! That ad sounds really informative, I’m going to keep my eye out for it cause I want to read it! It’s funny that you mentioned that ad describing the weird ingredients because I just saw an ad today for some all natural bar, and it was talking about ingredients and said something like, “Unless you have cravings for xanthum gum or something unnatural like that,” and I was thinking that it’s funny how I actually have a bag of that in my kitchen that I use regularily. Perhaps the people who created their ad should have done their research before slamming xanthum gum as something terrible and awful. I love that ad! What great information! I also wear a cardigan to work or at least bring one with me. It’s a joke in my office that once they turn the air on for summer I’ll have to bring in a parka! I’m always so freezing!!! I have not seen the ad yet, but I am definitely going to check it out.. if not on in a magazine.. I will find it online. I think the add is a very good idea but because it’s so wordy I’d question how many people would actually read the whole thing tho. Personally I too avoid foods with way to many ingredients, ones that sound like/are chemicals, ones I have no clue what they are haha. I love your dress its so cute especially the sleeves! I need to check out that ad! What a great way to educate people. Thanks for talking about that Panera salad in a previous post! I had it last time I was there without the wonton strips and chicken. I thought it was fabulous! It is such a bummer that my favorite salads there are always for a limited time! lol. Oh well-maybe it is because of what ingredients are in season! 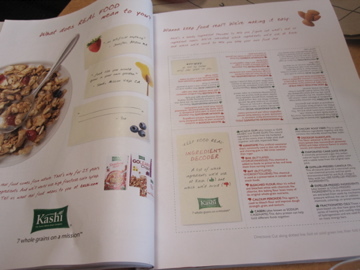 I *have* seen Kashi’s ads, and thought it was interesting that they won’t use xantham gum. Wowsers… You look wickedly hot in that dress!!! LOVEE that dress!! that ad sounds good! if pppl actually read it! I would! Too bad Kashi’s parent company, Kelloggs, uses all of the ingredients they slam in the ad 😦 Oh well, I do appreciate the educational part! That’s definitely a cool ad, though I haven’t see it yet! I try not to label things as “good” or “bad”, but there are definitely some ingredients I always try to avoid. Hopefully people do pay attention to that! I think that ad is great! I don’t think many people will pay attention to it unless they’re interested in that kind of stuff already (like us food bloggers), but it doesn’t hurt! I’m impressed by your run this morning. I would have been gasping for breath! Cute out fit too. Sounds like a good way to start the day! Thanks again, happy thursday ! I haven’t seen the ad yet but I hope to soon. However, classifying things as “good” and “bad” just leads to more misinformation of uneducated consumers. 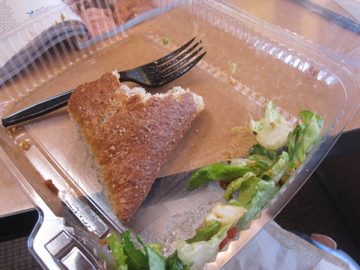 I just had panera last night for dinner and scarfed down the whole grain baguette too – delish! I hope people read the ad, but unfortunately I think that some people can be lazy and not want to take time to read the whole thing. Or the length will peak reader curiousity. Who knows. 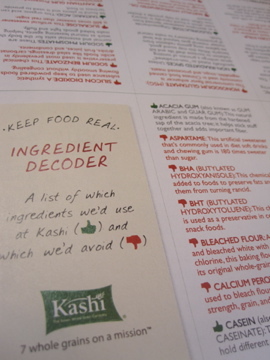 Either way, I love that Kashi is educating consumers.